Many times I find that gluten free bread, once toasted, becomes very very crunchy. Make a complete sandwich out of 2 slices and I wind up with irritated gums from biting into all that harsh bread. Today I decided to try something different. 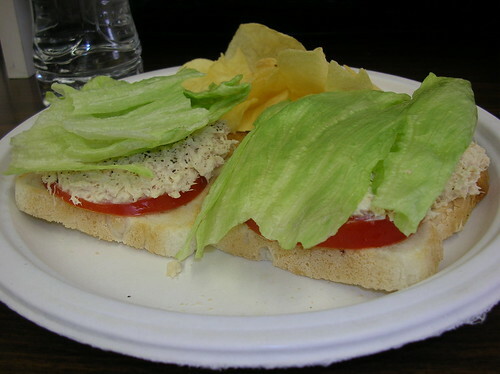 Toast 2 slices of gluten free bread, I used Glutino Corn Bread today, top with fresh tomato slices, tuna (Starkist tuna, Hellman's Mayo, black pepper) and iceberg lettuce. Add a side of Utz potato chips and you're all set! I'm a big fan of fast and easy lunches and this is definitely one of them. doh watch out for the salmonella tomatoes!